Base Camp Brewing is kicking off the year with their first of many nonprofit fundraising parties! TKO + Base Camp Brewery are throwing a party! 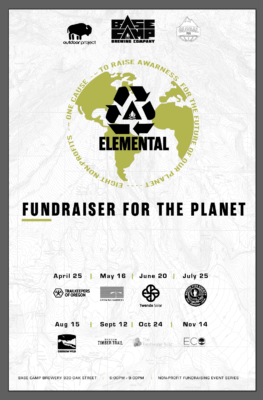 Part of a nonprofit fundraising series throughout 2019, we are excited to kick things off during Earth Week with the TKO Trail Builders Expo. Get schooled at the TKO Trail Builders Expo on training opportunities for trail building skills with cross-cut saws, building rock structures and other trail building activities. Bring the whole family for this fun evening of beer, learning, and supporting our training programs. Trail videos and slides from our trail stewardship work, updates on the trails we hold near/dear and where we are growing our stewardship work across the state. Learn from our TKO Rock Team how to shape and stack rock at our demonstration station in the beer garden. Grab a partner to run a 2-person crosscut saw and get yourself a nice little wood cookie momento. Click here to find out a bit more about the party, raffle tickets, and future 2019 fundraiser!